When it comes to selecting a battery supplier, you want someone you can trust. After all, having a reliable battery to power your telecommunication systems is an absolute must. In order to ensure our customers have a battery they know they can rely on for years to come, Conley Equipment Company has partnered with East Penn Manufacturing. 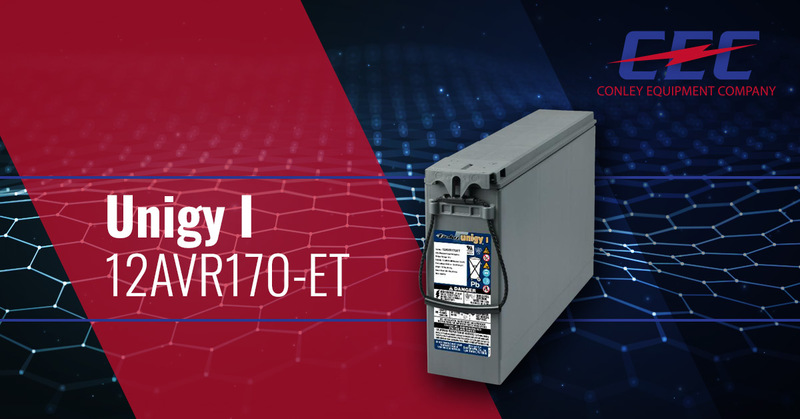 Their Unigy I – 12AVR170-ET battery is as reliable as they come. East Penn Manufacturing is able to offer the high-quality battery products they do because of their constant investment in innovation. Their constantly-advancing technologies allow them to create new products — and refine old products — that push the industry forward. Their commitment to the environment has lead to developments in energy storage solutions that not just protect the environment, but also actively make it better. Their Unigy I telecommunication battery product line puts those principles to work. If you’re in need of a new or replacement 12AVR170-ET battery, here are some of the benefits you’ll receive from East Penn’s product line. Conley Equipment Company is the largest value added reseller for East Penn Manufacturing in the country. This means you can benefit from VIP pricing and unrivaled customer support. If you’re ready for your free quote on a Unigy I – 12AVR170-ET battery, please fill out the contact form to the right. Perhaps you aren’t sure what sort of telecommunication battery you need. That’s no issue at all. Our battery experts can guide you through the entire process. We also offer a full range of battery services for a variety of industries. When you need an experience battery company that actually provides solutions that work, turn to Conley Equipment Company. East Penn has put together an excellent cut sheet outlining the features and benefits for their Unigy I – 12AVR170-ET battery. You can read it by scrolling through our Product Literature section here.